and have been wearing it just about every day since then. I sold my Submariner some months ago because I just couldn't get used to its oddly proportioned case/lugs -- both visually and in terms of wearability -- and was looking for a diver of at least equal quality that would be less clunky than the Submariner. 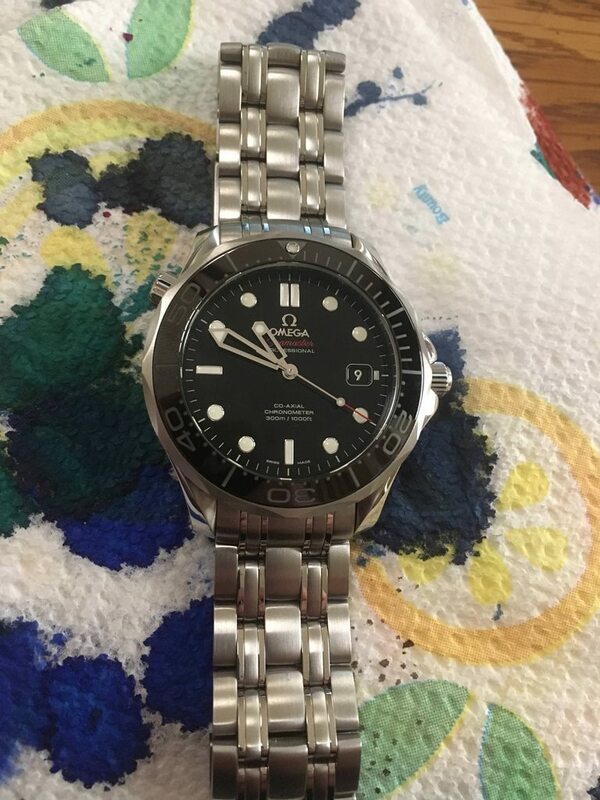 This Seamaster, though it is 41 mm (as compared to the Submariner at 40 mm), wears perfectly, perhaps because of the unobtrusive and beautiful lug design. And it runs absolutely spot on. It fits nicely with my Explorer and Oyster Perpetual 39 (blue dial) and Nomos Tangente Neomatik 39 Silvercut. Those three are similar in theme (time only), and now, with this Omega added, my group of four satisfies every interest and occasion for me. There are few other mechanical watches I can think of offhand that I might want or need. This is not my first Omega -- over the years I have owned three others -- so I'm glad to be back on the Omega Forum again.